Note: The anniversary file pages have over time been split and split again as they have grown. Please use the index at the end to find the month you want. A note on sources also appears at the end. The file contained over 630 entries at its last update. 1 January 1896: Hastings 0 Arsenal 12. Arsenal played 29 friendlies in the course of the season in addition to their 30 league games, but generally crowds were disappointing. This is one of only two games where no crowd is recorded. We do know however that Henry Boyd scored six. 1 January 1899, 20,000 turned up\ at the Manor Ground for the FA Cup match against Derby but it ended: Arsenal 0 Derby County 6. 1 January 1903: After being a near ever present Fred Coles ceased to play regularly after this game – a 1-0 win at Stockport. He played the last match of the season and again on January 16 1904, but moved to Grimsby Town in June. Later he became a cricket and football coach in Gothenburg, Sweden. He was also trainer of Hague in Holland between 1910 and 1911. 1 January 1903: William Bannister played his first match away to Stockport. He played just 18 league games for Arsenal before moving to Leicester in May 1904. 1 January 1906: Bolton W 6 Arsenal 1, a result that left Arsenal with one win in seven. However recovery was around the corner as Arsenal won the next league game 5-1. 1 January 1908, A rule was introduced that transfer fees be limited to £350, but by and large the clubs ignored it, and it lapsed. Despite attempts by Henry Norris and others to introduce a limit that would be agreed and would hold, none was ever achieved. 1 January 1910: Arsenal Reserves played a home game against West Ham in blue shirts. Quite why Arsenal used such a colour it not known although it is possible that the shirts were borrowed. 1 January 1910: Arsenal’s worst season thus far in their history, started the new year badly with Liverpool 5 Arsenal 1, in a run in which the club had four defeats and one draw. 1 January 1921: Arsenal 1 Bradford City 2. It was Bradford’s last league triumph as their decline set in and they were relegated at the end of the season. Bradford City had one more season in the first division before they were relegated too. This was also the day car tax was introduced in the UK. 1 January 1923: A 5-0 away win over Blackburn (the highest away win of the season) made it 13 scored and none conceded in last three games as it began to look as if manager Henry Knighton might have at last turned the corner. It was however a false hope. 1 January 1924: The BBC first broadcast of what it called “Weather Shipping” later to be known as the Shipping Forecast. It is still with us today. 1 January 1927: Arsenal 3 Cardiff 2. The first game for Harold Peel – a Chapman signing that didn’t quite work. He moved on to Bradford City in 1929. Brain got a hat trick. 1 January 1931: All speed limits for cars and motorcycles were abolished under the Road Traffic Act 1930 and Britain’s roads became a free for all. 1 January 1934 Herbert Chapman went on a scouting trip as the tragedy of his untimely death started to unfold. He died on January 6. 1 January 1938: First game for Reg Lewis who had joined from Margate in 1935. 1 January 1968: Davor Suker born. He was Real Madrid’s top man in his prime, but only played occasionally for Arsenal and left on a free transfer to WHU. His life was later surrounded by controversy, although many still hold him in high regard. 1 January 1985: Arsenal 1 Tottenham 2. Steve Williams debut; Woodcock scored. The result left Tottenham top of the league, five points ahead Arsenal in fourth. 1 January 1986: For second year running Arsenal played Tottenham on New Year’s Day, this time the score being 0-0. After this game Arsenal were 7th and Tottenham 10th. 1 January 2001 Charlton Athletic beat Arsenal for first time in 44 years and the club had its first away win since November. Within a year there was early talk of Arsenal going through a whole season unbeaten away from home. 1 January 2002: Leicester v Arsenal should have been game 21 of the third Double season but was postponed because of the frozen pitch at Filbert Street. 1 January 2005: Emmanuel Eboue joined Arsenal from Beveren. He went on to play 132 games for Arsenal before moving on to Galatasaray. 1 January 2009: Ivan Gazidis became chief executive of Arsenal, replacing Keith Edelman. 1 January 2014: Arsenal 2 Cardiff 0, with goals from Bendtner and Walcott, but Bendtner was injured in the game and joined Giroud, Ozil, Ramsey and Gibbs on the injury list. 2 January 1886: The match Selby v Woolwich United is recorded in the press as having been played – seemingly proof that there was already football in the Woolwich area before Dial Square and Royal Arsenal (not least because there is only one town called Woolwich in the UK). Reference has also been made to “Woolwich Union” – but that was certainly not a football club. 2 January 1887: An advert appeared in “The Referee” by Dial Square F.C. seeking matches – proof that the club did not become Royal Arsenal on Christmas Day 1886 as is stated in many histories of the club. 2 January 1897: Arsenal played in the fifth qualifying round of the cup beating Chatham 4-0, but there was still yet one more round to go (the “Supplementary round”) before the competition proper. The number of preliminariy rounds shows the way in which the FA Cup had come to dominate football since its foundation 26 years before. 2 January 1903: Harry Bradshaw, was charged with “keeping the Manor Ground for the exercise of a lottery” found guilty and fined after Arsenal’s archery tournament was found not a competition of skill. The fine was £5, but the tournament raised £1200 – almost a quarter of the annual income of the club. Even if you never click on a link from this site, do read this one. It is fascinating! 2 January 1911: The Sidney Street massacre, the backdrop to the football novel “Making the Arsenal” – the ending of the siege was an event that occupied the nation, which felt itself to be under threat from anarchists. 2 January 1912: Alexander Graham joined Arsenal. He played 179 games for Arsenal before and after the war. He was one of many players who left England during the war, working in the Scottish coal mines and playing football in the Scottish league which did not wind up during the war, as the English league did. 2 January 1915: Harry King scored four as Arsenal beat Wolverhampton 5-1, just one week after beating Leicester 6-0. It was the start of a run of four successive victories that made promotion a real possibility. 2 January 1927: Peter Goring born. A major star, he played over 200 games post war and won the league with Arsenal – his only league club. He played first to Cheltenham Town, and then after Arsenal for Boston Utd later managing Forest Green Rovers for 11 years. 2 January 1933: Top of the table Arsenal lost 3-2 to 3rd placed Sheffield Wednesday. Jack got the goal in the first half and Bastin scored a penalty in the second, It was only the second away defeat in the whole season. 2 January 1934: Herbert Chapman watched Sheffield W v Birmingham City (Sheff W being Arsenal’s next opponents) shortly before his unexpected tragic early death. See also here. 2 January 1939: Rangers and Celtic played their traditional year opener. This time however the match was of particular significance since it is recorded as having the highest attendance for a U.K. football match ever at 118,730. 2 January 1949: Sir Samuel Hill-Wood, chair of Arsenal, died in office, the first Arsenal chairman to do so. He had been a director of the club for 26 years and was instrumental in taking over Arsenal from Sir Henry Norris and reversing the policy of selling shares to supporters to create a club owned by its fans. 2 January 1965: John Radford became Arsenal’s youngest ever scorer of a hat-trick against Wolverhampton W aged 17 years and 315 days as Arsenal beat Wolverhampton 4-1. In all he played 13 games this season and scored seven. 2 January 1970: Arsenal paid £100k for the first time for a player – Peter Marinello. (The transfer date also quoted as Jan 6). Despite his awesome talent he only played 38 league games for Arsenal, partly due to his wayward lifestyle and party the intransigence of manager Bertie Mee. 2 January 1971: Arsenal were due to play Yeovil in the FA Cup for first time in 3rd round of what was to be the start of the Cup element of the first Double. However the match was postponed due to the weather. 2 January 1978: Peter Simpson made his final appearance in Arsenal 1 Ipswich 0. He had played 370 league games for Arsenal, and had two loan spells, rather unusually in North America, in the late 1960s. He was displaced by the Young/O’Leary centre back partnership. 2 January 1982: Stewart Robson became Arsenal’s youngest FA Cup player in the game: Tottenham 1 Arsenal 0. FA Cup 3rd round. 2 January 1989: Arsène Wenger made his first visit to Highbury, dropping in to watch a match while returning to Monaco from watching a game in Turkey in preparation for a European tie. Arsenal beat Tottenham 2-0. It launched his friendship with David Dein. 2 January 1996: Newcastle 2 Arsenal 0 making it one win in eight under Rioch. The run was finally ended with two successive 1-0 victories in Ff. 2 January 2007: Justin Hoyte scored the first Arsenal goal to be scored by an Englishman for Arsenal at the Emirates. It was his only Arsenal goal. It ended Arsenal 4 Charlton 0, the other goals coming from Henry and Van Persie (2). 2 January 2008 Matthew Connolly (who had played in the 6-3 cup win at Liverpool in Jan 2007 but never in a league match for Arsenal) was sold to QPR for £1m. He has since won the Championship three times. 3 January 1908: Dr James Marshall known as Jimmy was born in Avonbridge, in Stirlingshire and started out with junior club Shettleston in the east end of Glasgow before joining Rangers in 1925 – where he stayed for nine years, winning five league trophies. 3 January 1911: Winston Churchill the home secretary took the unprecedented step (one which has since never been repeated) of personally leading the Metropolitan Police in action against a criminal gang – in this case a group of Latvian anarchists who were trapped in a house in Sidney Street in the East End of London following a jewel robbery. 3 January 1913: Ralph James Evans Birkett was born in Dartmouth, Devon, (or according to other sources Newton Abbot, or Ellacombe Torquay neither of which are far away) on 3 January 1913 (9 Jan in some sources). He joined Arsenal in 1933 for £1518 and was one of Chapman’s last signings. 3 January 1919: Soldiers blockaded Folkestone harbour in a successful protest against being returned to France. This was in effect a mutiny… and in the face of it the government caved in, undoubtedly aware that the mood of the population had changed. Four years of privation had left their mark, and the populace now wanted a return to normal life. 3 January 1920: Arsenal drew 2-2 at home with Manchester City but the game saw the loss of their first choice right back and first choice keeper and in the next six games Arsenal lost five and won one. 3 January 1925: A 1-2 away defeat to Liverpool starts a run of 6 consecutive defeats during which Arsenal scored just two goals. It was the run which finally ensured that Leslie Knighton would be replaced by Herbert Chapman as manager. 3 January 1934: Despite feeling unwell Herbert Chapman went to watch the Arsenal “A” team. Mr Chapman was warned to take it easy, but he refused, and tragically died from pneumonia on January 6, aged 55. 3 January 1951: Having been rejected by Wolverhampton, Dennis Evans was signed by Arsenal for £1500. He subsequently played over 200 games for Arsenal – his only club. 3 January 1953: Arsenal lost 1-3 at home to Sunderland and as a result slipped from second in the league down to sixth. John Spurling recounts the story that Peter Goring was confronted by a fan who said that he’d seen the Arsenal team of the 30s and that the current team wasn’t fit to lick their boots. Peter is quoted as saying, “I wasn’t the only player to be confronted in such a way. Some of the other boys also got hassle from fans which wasn’t nice”. 3 January 1977: Alan Hudson, the man who quite amazingly gave Stoke City creativity, made his debut with Arsenal in a 1-1 draw with Leeds in front of 44,090 spectators. 3 January 1981: Everton 2 Arsenal 0. After 3 consecutive FA Cup finals, Arsenal went out in the third round. The same happened in 1982 (a 3rd round defeat to Tottenham), and Arsenal did not reach another cup final until 1993. 3 January 1994: Arsenal 0 QPR 0. The start of a five match sequence of drawn games. Two were goalless, three were 1-1. This was the second sequence of draws this season – in October Arsenal had played four consecutive goalless games. 3 January 1998: Arsenal 0 Port Vale 0 (FA Cup round 3 – the first cup game of the second Double.) The second double: part 1, part 2, part 3. 3 January 1999: Sir Alex Ferguson’s notorious speech published in Sunday Times in which he claimed Arsenal were responsible for numerous fights on the pitch in what was the most blatant piece of public ref-fixing seen thus far. Ferguson claimed he then apologised, but Arsène Wenger said, “If he sent an apology it must have been by horse”. 3 January 2011: Aaron Ramsey’s loan with Nottingham Forest which aimed to help him recover after his horrific injury was completed successfully. 4 January 1892 (Exact date uncertain, but very likely 4th or 5th) The court hearing in the case in which George Davie took Arsenal to court for wrongful dismissal. Royal Arsenal won the case which confirmed the legality of the retain and transfer system until it was challenged again by George Eastham. However the case also served to rally those who opposed the Committee that ran Royal Arsenal FC and began the process that led to the split of the club in two in 1893. 4 January 1896: Final game for David Howat (the man who was our first ever substituted player). He played 72 times for Arsenal but what happened after he left the club is a total mystery. 4 January 1908: Ernie Coleman born in Blidworth, Notts. He first played for Hucknall Colliery was signed by Nottm Forest but didn’t get a game, moved to Halifax Town and then Grimsby Town with whom he scored 57 goals in 85 games – mostly in the first division. 4 January 1913: Bolton 5 Arsenal 1. Part of a run in which Arsenal let in 15 goals in four games. Arsenal were relegated at the end of the season. 4 January 1919. Having played Millwall Athletic in the Victory Cup 3 days before the clubs met again in the London Combination (the war time league) at Highbury. Arsenal won 4-1 with Hardinge and Chipperfield each getting two goals. 8000 were present, a crowd total which showed the first signs of growth since the war ended two months before. .
4 January 1930: Jimmy Dunne scored four goals for the second consecutive match for Sheffield Utd – an event that must have put him on the radar of Chapman – although it took Chapman another three years to sign him. 4 January 1934: Having continued to go and watch matches and be involved in the club’s affairs despite being very ill Herbert Chapman was forced to bed and was diagnosed as suffering from pneumonia. 4 January 1936: Having won the league for each of the past three years Arsenal were looking as if they would not retain the title, and a draw with Birmingham on this day confirmed that, as Sunderland were now nine points above Arsenal at the top of the league. 4 January 1958: Arsenal lost 3-1 to Northampton in the FA Cup round 3, as Jack Crayston’s short tenure as manager slipped away. It was the first time in 10 years that Arsenal had exited in the first Cup match of the season. 4 January 1975:Arsenal were 19th in the table having won one of their last five league matches. Now in the FA Cup the result was Arsenal 1 York City 1 in front of just 27,029. The team that took the field was Rimmer, Rice, McNab, Kelly, Mancini, Powling, Storey, Ball, Armstrong, Kidd, Cropley. York took the lead after mistakes by Kelly and McNab allowed Holmes to race through before passing to Seal who could slot home. Kelly redeemed himself seven minutes later with a strong volley which gave Arsenal the equaliser. 4 January 1986: In a howling gale and with games postponed elsewhere as the snow came down Arsenal beat Grimsby 4-3 on the edge of the North Sea. The pitch was a slippery mud bath but still Charlie Nicholas scored a hat trick, and Rix the fourth. 4 January 1987: An unbeaten run from 4 October 1986 continued to this day with the beating of Tottenham 2-1 in the league away to take Arsenal top of the league. The goals came from Tony Adams and Paul Davis with just 37,723 in the stadium. See also here. 4 January 1992: Wrexham 2 Arsenal 1 FA Cup 3rd round. On 29 July 2011 BBC Sport described the result as one of the biggest cup upsets of all time, although it has never obtained the historic significance of the defeat to Walsall under Herbert Chapman. 4 January 1999: Preston 2 Arsenal 4. FA Cup 3rd round en route for the final. Boa Morte, Petit (2) and Overmars got the goals with 21,099 in the crowd. 4 January 2000: Brian McGovern loaned to QPR. He made just one appearance as a sub in a league game. He subsequently played 21 times for Norwich before moving into Irish football, ending his career with Bray Wanderers in 2006. 4 January 2004: Leeds 1 Arsenal 4, (FA Cup) the 3rd consecutive 4-1 win at Elland Road, symbolising the rising and falling status of the teams. 4 January 2013: Chamakh loaned to WHU. He never seemed to fulfil his early potential at Arsenal but was later revealed to have been affected by deeply troubling personal problems. 4 January 2014: Arsenal 2 Tottenham 0. Walcott was injured and missed the rest of season and World Cup. As he was carried from the ground Tottenham fans hurled missiles at Walcott and the ambulance team, an event which led to a police review of safety at the away end of the Emirates. 4 January 2015: Arsenal’s lowest home attendance of the season – 59,439 – came to see the two finalists of the FA Cup in 2013/14 start off their FA Cup journeys again. It ended Arsenal 2 Hull 0. Mertesacker and Alexis scored. 4 January 2018: Konstantinos Mavropanos signed for Arsenal from PAS Giannina for a fee of around £2m. 5 January 1887: The Woolwich Gazette reported on 7 January 1887 that sometime between 1 December 1886 and 5 January 1887 a meeting was held to widen the club to everyone in the area, and this club effectively broke away from the Dial Square Cricket Club and became Royal Arsenal Association Football Club. 5 January 1901. Darwen 0 Arsenal 2. As a result of this victory Arsenal reached the first round proper of FA Cup; the significance being that this was the first season ever that Arsenal went on beyond the first round proper. 5 January 1907: Middlesbrough 5 Woolwich Arsenal 3. Arsenal had just gone five games without defeat since losing 5-1 to Birmingham. Indeed during this winter period Arsenal were either unbeaten, or let in five! 5 January 1916: The Military Service Bill started its journey through Parliament – this being the bill that enforced conscription into the armed forces of young single men. In Fulham the authorities asked Henry Norris to operate the scheme, a request that led to his employment in the War Office and his ultimate rise from no military rank to the position of Lt Colonel. 5 January 1917: Arsenal had ended 1916 with 3 wins and a draw in their last four games – a significant upturn on performances earlier in the season, and the improvement continued with an away game against Luton on this day which resulted in a 4-1 win, in front of 3000 fans. 5 January 1918: As the war progressed through its fourth year, the new year’s football began on 5 January with a home game against Millwall Athletic. Only 4000 made it to Highbury to see Arsenal win 1-0. 5 January 1939 Ted Platt, the man who became our wartime keeper, signed for Arsenal, aged 17. Arsenal had an obvious regular first choice goalkeeper in George Swindin, and a reserve in Alex Wilson who had joined the club in 1933. Ted Platt was one for the future, but of course the future of football was postponed. 5 January 1946: Joe Wade debut in the FA Cup which this season was played on home/away basis.as there was no national football league. Arsenal lost 6-0 to WHU in first leg. Joe only played irregularly but was part of the championship winning season the following year. 5 January 1952: Arsenal 2 Aston Villa 1. Start of ten match unbeaten run. Roper got both goals, and indeed scored five in five. The push up the table however was not enough and eventually Arsenal finished third. 53,540 attended the game. 5 January 1958: Steve Walford, born in Highgate. He started out with Tottenham in 1974 but he only played twice for them before Terry Neill, who of course himself at been at Tottenham, signed him for Arsenal for £25,000 on 1 August 1977. 5 January 1961: John Butler, the first centre half to play in the revolutionary WM formation, died aged 66. After playing 267 times for the club he was sold to Torquay United for £1,000 after which he became the coach of Royal Daring, in Belgium, and coach of the Belgian national side in the 1938 World Cup. After the war he managed Torquay United, Crystal Palace and Colchester Utd, before retiring from football in 1955. 5 January 1970: Death of David Halliday. He is said to be the only man in the top division in England to score 30+ goals in four consecutive seasons, and was bought by Chapman for Arsenal, but only got 15 games, scoring eight goals. 5 January 1974: Christopher Buckley – the Arsenal player who became Villa chairman, died. He had played for Villa until 1914 when he joined Arsenal. Because of the war he only played 56 times for Arsenal before retiring from playing in 1921. 5 January 1980: Terry Anderson drowned (or 24 January – reports quote different dates). Terry joined the Arsenal ground staff at the age of 15 in 1959. The following year the football apprenticeship scheme was inaugurated and Terry was offered an apprenticeship which he accepted. Among his fellow apprentices were David Court, Gordon Ferry and Rodney Smithson who all went on to play for the first team. 5 January 1991: David O’Leary scored an own goal against Sunderland in a style that was to be copied by Lee Dixon on 7 September in the same year. However this time Arsenal won 2-1. 5 January 2002. Watford 2 Arsenal 4: FA Cup 3rd round, the start of the FA Cup victory in the 3rd double season. Henry, Ljungberg, Kanu and Bergkamp scored, but it was Henry who was the star, scoring the first, setting up the second. 5 January 2009: Jack Wilshere signed professional forms. He joined Arsenal aged nine, and went on to be an England international and an integral part of the club although his career was beset by injuries in 2014 and 2015. For 2016/17 he was loaned to Bournemouth. 5 January 2013: Johan Djourou loaned to Hannover. After a further loan with Hamburg his signed for that club and left Arsenal. In all he played 86 league games and scored one goal for Arsenal. 5 January 2015: Lukas Podolski loaned to Inter Milan until the end of the season. It was suggested the manager was upset by his unwillingness to track back, but during his loan Podolski suggested he would certainly return to Arsenal in the summer; but he didn’t. 6 January 1903: Tommy Shanks signed from failing Southern League club Brentford. He went on to be a star striker at Woolwich Arsenal, but then just as Arsenal got promotion to the first division he went back to Brentford, at the height of his fame. 6 January 1906: After losing 1-6 away to Bolton on Jan 1, Arsenal beat Sheffield U 5-1 at home in the next match. Coleman (2), Fitchie, Garbutt, and Ducatt scored. 6 January 1912: A 10 game run up to a home draw with Villa on this day in front of a paltry crowd of 6,000 showed Arsenal having won two, drawn one, and lost seven. Worse, the defeats included a 5-0 drubbing by Tottenham on Christmas Day in front of 47,000 at White Hart Lane although Arsenal won the return game on Boxing Day with 22,000 in the Manor Ground. 6 January 1912: As a result of cost cutting this was Jackie Chalmers last game for Arsenal having played 48 games and scored 21 goals. 6 January 1915: Birmingham beat Glossop North End 11-1, the highest score of the season. Glossop were run by the Hill-Wood family and shortly after they closed down the club much to the local fans dismay, and went looking for a bigger club they could take over. Eventually they moved in on Arsenal and destroyed the notion of a club owned by its fans..
6 January 1919: The Football League Management Committee started to debate the demands of the reformed Players’ Union over salaries, and to discuss the idea of amalgamating the Football League with the Southern League. These discussions led onto the idea of expanding the League by four clubs for the 1919/20 season. 6 January 1934 – Herbert Chapman died of pneumonia aged 55 at his home in Hendon. He had won the league twice with Arsenal and the FA Cup once, but more than that he set up the regime that would run Arsenal until 1953. After lobbying by the Arsenal History Society a statue was erected to him at the Emirates in 2012. 6 January 1938: Joe Hulme transferred to Huddersfield town after 12 wonderful years at Highbury in which he played 333 games, scored 107 goals. He won three championship medals, two Cup winners medals and was the only player to play in all of Arsenal’s first Cup finals. 6 January 1951: Arsenal 0 Carlisle 0. FA Cup 3rd round. Crowd 57,932. Carlisle were in the third division north, and Arsenal were the Cup holders – it was quite a shock, although Arsenal won the replay. 6 January 1971: Yeovil 0 Arsenal 3. FA Cup 3rd round in the first Double season. The Yeovil chairman was reported in the papers saying, “McLintock’s too old and Wilson’s too slow”. 6 January 1979: Arsenal played Sheffield Wednesday away in a 1-1 draw. Terry Neill described the Wednesday pitch as the worst he’d ever seen and matters were made worse by the refusal of the referee to call for action to be taken against the Wednesday fans who pelted Arsenal players with snowballs throughout the game. 6 January 1993: Scarborough Town 0 Arsenal 1. Cup Match 6 of Arsenal’s Cup Double season, in the fourth round of the League Cup. Scarborough were formed seven years before Arsenal, but went out of business on 20 June 2007 with debts of £2.5m. 6 January 2001: Carlisle 0 Arsenal 1; FA Cup round 3 as Arsenal started on the journey to the final. Wiltord scored the goal on the ground in which Arsenal had been notoriously beaten 2-1 in December 1974, when the police entered the pitch to stop players fighting. 6 January 2011: Wellington Silva bought from Fluminese. He came with seemingly huge potential but in a long series of loan spells appeared occasionally to lose this way. He finally got his work permit and was loaned to Bolton in 2015 but then returned to Fluminese having failing to make his European breakthrough. 6 January 2012: Thierry Henry returned for a short term loan. He played four games and scored one classic Henryesque goal cutting in from the left in the match against Leeds. 6 January 2014: Walcott was confirmed as being out for at least six months following injury in the match against Tottenham. It ended up being a year, but he came back to score the all-important opening goal in the 2015 cup final. 7 January 1887: The Woolwich Gazette reported a meeting was held to make the Dial Square football club that had broken away from Dial Square Cricket club open to everyone in the area, rather than just the employees of the Dial Square factory. As a result the club became, by this date, Royal Arsenal FC. 7 January 1895: Arsenal’s first ever game against Leicester ended Leicester Fosse 3 Woolwich Arsenal 1 in front of a crowd of 3000. It was Arsenal’s third successive defeat following an amazing 7-0 victory over Port Vale on December 25. 7 January 1905: Fred Dwight was signed on 5 June 1903 and played his first and last game for Arsenal on this day, away to Preston. We lost 0-3. It was one of three consecutive defeats in which Arsenal scored no goals but let in nine. 7 January 1922: In the 1st round of the FA Cup for the second year running Arsenal played QPR – last year they had lost away 0-2. 31,000 turned up for the match at Highbury, but the result was a goalless draw. 7 January 1933: Arsenal, top of the league, lost 3-2 to Sunderland who before the game were 8th. There was talk that teams had finally worked out how to play against Arsenal’s high speed counter attacking style with that very quick pass out of the defence through the half backs onto the forward line. Up next was Walsall in the Cup, but everyone thought that would be a doddle. 7 January 1939: in what was becoming the most disappointing league campaign of the 1930s, Arsenal played Chelsea in the FA Cup but lost 1-2. It was clearly a sign that Arsenal were in decline and needed a complete rebuild, but that rebuilding had to be postponed. 7 January 1950: Arsenal 1 Sheffield W 0 – another cup run began – Lewis scored with 54,193 at Highbury. It was the first time since before the war the club got past the fourth round. 7 January 1950: Malcolm Macdonald born. He played for Tonbridge, Fulham, Luton, Newcastle Utd and finally Arsenal. In all he played 84 league games for us and scored 42 goals – a remarkable record although curiously, for a man remembered as a centre forward he started as a full back. 7 January 1956: Arsenal 2 Bedford 2, FA Cup 3rd round. Although Arsenal were slipping in form since winning the league in 1953, this was considered one of the most unimaginable shocks, although Arsenal did win the replay 2-1 after extra time. 7 January 1967: Arsenal 0 Tottenham 2, giving Tottenham the double over Arsenal in Mee’s first season. Little did they know what was ahead in the years to come! 7 January 1974: Matthew Shortt died. He signed for Arsenal from Dalbeattie Star and played for a short while for the club before emigrating to the USA where he helped pioneer football playing for five different clubs and (reportedly) for the USA team. 7 January 1975: In the FA Cup it ended York 1 Arsenal 3 after extra time following 1-1 draw at Highbury. Kidd got a hattrick. Arsenal needed replays in the next two rounds before going out to West Ham in the sixth round. 7 January 1978. Sheffield U 0 Arsenal 5 in the FA Cup on the way to Wembley. The journey ended in defeat to Ipswich. Macdonald (2), Stapleton (2) and O’Leary got the goals. 7 January 1987: Stewart Robson – who later took on the mantle as prime critic and of Arsène Wenger on TV and beat the path that many a little blog and journalist then followed – was sold to West Ham for £700,000, having played 150 league games for Arsenal. 7 January 1988: Charlie Nicholas sold to Aberdeen for £400,000. Brought in as the great hope of revitalising Arsenal by Terry Neill, he never quite lived up to expectations. 7 January 2004: Everton 1 Arsenal 1. The 20th league match of the unbeaten season. Cygan was recalled in central defence, Touré moved onto the right, Lauren was dropped, Parlour started in place of Gilberto in midfield. Kanu gave Arsenal the lead; Everton equalised 15 minutes from time. Man U however won on this day to give them a 3 point lead. 7 January 2018: Defending FA Cup holders who had won the cup three times in four years and a record number of times overall, were beaten in the 3rd round by managerless Nottingham Forest. It was the only defeat in the 3rd round of the Wenger era, in what turned out to be his last FA Cup match. He remains the manager with more FA Cup wins than any other. 8 January 1887: Royal Arsenal (as opposed to Dial Square FC) played their first game – against Erith on Plumstead Common. Arsenal won 6-1, part of an opening sequence of three matches in which the club scored 23 goals. See also here. 8 January 1910: Sheffield United 2 Woolwich Arsenal 0. Arsenal’s disastrous run continued amidst financial rumours, which took the club to the edge of bankruptcy. Rescue however was on hand in the shape of Henry Norris, later in the year. 8 January 1916: Arsenal 4 Croydon Common 2. The game showed that the Common continued to play during the war. But it was the only Southern League club not to continue after this season, and thereafter several Common players turned out for Arsenal, eventually transferring to Arsenal in 1919. .
8 January 1921: George Grant, the alleged “Chinese international” having played In 57 times and scored four goals.for Woolwich Arsenal, The Arsenal and Arsenal, now played against Arsenal in the FA Cup. It ended QPR 2 Arsenal 0. 8 January 1927: Sheffield U 2 Arsenal 3 as Arsenal started the journey to their first FA Cup final. Prior to the arrival of Herbert Chapman, Arsenal had reached the cup semi-final twice – in 1906 and 1907, but had lost both times. 8 January 1930: Bert Humpish joined Arsenal from Wigan aged 28 – perhaps the oldest non-league player to come to Arsenal in the modern era. 8 January 1949: Arsenal 3 Tottenham 0 in FA Cup round 3. It was the first FA Cup match between the two. McPherson, Roper and Lishman scored. It was the first time in four seasons Arsenal had made it past the third round. 8 January 1957: Don Roper returned to Southampton after 10 glorious years at Arsenal, but his return ended in a dispute that soured relations with the club for the rest of his life. 8 January 1962: David Court signed as a professional. He returned to Arsenal as head of youth development and became the last member of the Swindin era at the club. 8 January 1972: Stoke City 0 Arsenal 0, in front of a typical Stoke crowd of just 18,965. Alan Ball failed again to find his way into the game and the travelling fans began to show a little impatience with their new star. He did not help his cause when, having one of the best chances of the game, receiving Armstrong’s centre on the far post he then missed the goal utterly. 8 January 1980: Arsenal 2 Cardiff 1, FA Cup 3rd round replay, part of another adventure that ended at Wembley. Sunderland got both goals after a 0-0 draw, meaning that Arsenal had now gone 13 FA Cup games without defeat. 8 January 1999: Jermaine Pennant joined Arsenal from Notts C for £2m. Although highly talented, he was beset with personal problems, and only played 11 times for Arsenal, but did get a hat trick in the first game of the 49 unbeaten run. 9 January 1863: David Danskin, reputed to be one of the founders of the Dial Square club, was born in Fife. He is thought to have been instrumental in arranging the first match,and stayed with the club for several years, however when he stood for election to the committee in 1892 he was not elected, almost certainly because he opposed the vote to turn professional in 1891. 9 January 1883: William Garbutt – the Arsenal man who became the “father of Italian football” was born into a regular working class home Stockport. He was an outside right who played for Royal Artillery (while in the army), and Reading (of the Southern League), before coming to Woolwich Arsenal in December 1905. 9 January 1913: Ralph Birkett born in Torquay. He joined Arsenal from Torquay in 1933 and played 19 games for Arsenal over two seasons. 9 January 1915: Harry King’s third hat trick in his record breaking run as Arsenal beat Merthyr in the FA Cup. He scored 26 goals in 37 league games in the season. 9 January 1926: Wolverhampton 1 Arsenal 1. Herbert Chapman’s first FA Cup match at Arsenal, the club finally going out in the sixth round to Swansea Town. The following season the club went one better and got to the final for the first time. 9 January 1932: Arsenal 11 Darwen 1 in the 3rd round of the FA Cup. It was the first time since 1893 that Arsenal hit double figures in the Cup – this time en route to the final. Bastin (3), Jack (3), Lambert (2) and Hulme (2) got the goals. 9 January 1937: Arsenal became the first team to take a point from Sunderland at Roker Park during the season. The result and scores elsewhere meant Arsenal were now top of the league by one point. 9 January 1960: Rotherham 2 Arsenal 2 (FA Cup) after Arsenal were 2-0 up with 20 mins to go to an own goal and a goal by Julians. At Highbury the replay finished 1-1 after extra time and Rotherham won the toss in the boardroom to choose the neutral venue for the third match. They chose Hillsborough and went through 2-0. 9 January 1965: It looked at last as if Billy Wright was getting his Arsenal team together. The 0-2 win over Darlington on this day in the Cup was routine – but it was one of four successive victories which gave hope to the club. 9 January 1971: Arsenal 2 WHU 0. League match 24 of the first Double season. The win left Arsenal just one point behind Leeds and with a better goal average. Graham and Kennedy scored to make it 14 without defeat. See Arsenal in the 70s part 3 Better still, Leeds lost to Tottenham 1-2. 9 January 1971: George Wood who later signed for Arsenal as understudy to Jennings was reported to have scored while playing in goal for East Stirlingshire v Queen of the South kicking the ball out of his area down the entire length of the pitch. 9 January 1993: Arsenal 1 Sheffield U 1. The eighth consecutive match without a victory during which run Arsenal scored just two goals. Hiller got the goal. In all Arsenal went 15 league games without scoring more than one goal in each. 9 January 2005: Arsenal 2 Stoke City 1, starting another successful FA Cup series. Stoke went ahead but Reyes and Van Persie scored in front of 36,579 at Highbury. 9 January 2007: Alex Song scored his first goal as Arsenal beat Liverpool 6-3 away in league cup with Baptista getting four. It was the first time in over 75 years that Liverpool conceded six at home. Having signed a new contract Touré captained Arsenal for first time. 9 January 2008: Arsenal 1 Tottenham 1; League Cup semi-final played in front of just 53,136, one of the Emirates lowest crowds reflecting the fact that it was Arsenal’s reserves against Tottenham’s first team. 9 January 2014: Akpom loaned to Brentford. He was also loaned to Coventry, and started to make first team appearances by the end of the year. In 2015 he started to make regular appearances with Hull in the Championship. 10 January 1018: Basic and fundamental rights to justice were granted to all freemen of England by King Knut. These were of course all removed following the conquest of the country in 1066 by the Normans. 10 January 1840: The Penny Post was started – an important issue when considering how Arsenal arranged the friendly fixtures in 1886/7, and in particular how Dial Square came to play Eastern Wanderers. Without the postal system it would have been impossible to arrange to play anyone except teams in Plumstead and Woolwich. Postage remained 1d until 1917. 10 January 1891: As Arsenal moved towards winning the London Senior Cup they played Old Westminsters. Old West appealed against the state of the ground, (it must have been truly awful for there to be an appeal) and Arsenal appealed against Old West for using an ineligible player. Old West eventually dropped out. 10 January 1900: Bristol City 1 Arsenal 3 – in the Southern District Combination – the competition that ended with a match v Tottenham which was abandoned due to abusive language from the crowd. 10 January 1903: First Arsenal game for Tommy Shanks. He performed reasonably in his first season and got caps for Ireland, before becoming a star turn in his second year at the club. 10 January 1904: James Devlin reportedly born in Bellshill on this day. However we suspect the town is right but the date is wrong. 10 January 1905: Andy Ducat joined from Southend Athletic. He became perhaps the greatest Woolwich Arsenal player of them all, and was only sold as the club sank into financial disaster, but returned to play again during the war years. 10 January 1910: Stories about Arsenal’s financial demise circulated throughout the month, and a fund raising committee was set up to try and help the club. The club did indeed go to the brink but was rescued by Henry Norris. 10 January 1914: FA Cup 1st round. Bradford City (away) Despite going well in the league (being third and equal on points with the top club) Arsenal lost 0-2. 10 January 1920: For the second year running an FA Cup match was played at Highbury although Arsenal were drawn away. Arsenal 4 Rochdale 2: Rutherford, Groves, Graham and Pagnam scored. 10 January 1925: FA Cup 1st round day but much of London was beset by dense fog and Arsenal’s game at West Ham was postponed. It is an important moment in unravelling the story told by Arsenal manager Knighton that the players were drugged, and as with so much of his testimony the tale he tells does not stack up with reality. 10 January 1931: Having drawn 5-5 in their last game Aston Villa went to Highbury for the 3rd round of the Cup. The result was a 2-2 draw, with Lambert and Jack getting the goals. London was crowded with fans that day as at the same time Tottenham played Preston (it ended 3-1) and West Ham played Chelsea (1-3). Brentford, Palace and Fulham were also all at home, playing in the third round. 10 January 1948: Arsenal 0 Bradford 1, FA Cup 3rd round. This was a huge shock as Bradford were then in Division 2, and Arsenal top of division 1. 10 January 1970: Peter Marinello’s debut, and he scored. But it was his only goal in 14 as Arsenal endured a 10 game run without a league win. It ended as a 1-2 away defeat to Man U and was the start of four defeats in a row. See Arsenal 1969/70. 10 January 1978: Football news was dominated by Liverpool’s decision to pay a British record £352,000 for Middlesbrough midfielder Graeme Souness. 10 January 1979: There was a little light relief for Arsenal fans from the travails of the season as Tottenham Hotspur were held to a 1–1 draw by non-league Altrincham. 10 January 1998: Arsenal 2 Leeds Utd 1. Overmars scored both goals. It was the 22nd match of the second double season and the third in an unbeaten run of 18 games that led to the title. The second double: part 1, part 2, part 3. 10 January 2012: Luke Freeman sold to Stevenage. Although described by Arsène Wenger as a very interesting prospect he never played for Arsenal in the League and settled for a career in the lower divisions. 10 January 2012: Francis Coquelin signed long term extension – but then spent 2013/14 on loan. However by Christmas 2014 he was back with the first team, although normally as a sub. His recognition as a quality DM came in 2015 and he became a first team regular. 10 January 2017: Cohen Bramell joined Arsenal from Hednesford Town and Daniel Crowley loaned to Go Ahead Eagles. Jon Toral was recalled from his loan to Granada. 11 January 1890: Arsenal 3 London Caledonians 1 in the London Senior Cup. The game saw Arsenal go through to the final. Arsenal lost this final, but won the final the following season. 11 January 1900: Charlie Preedy born in India – the first Arsenal player with this distinction. His father was with the Royal Artillery and the family moved back to England when Charlie was 7. However he did not become a professional player until he was 24, when he joined Charlton Athletic in the recently formed Third Division South. 11 January 1908: Arsenal v Hull City (FA Cup 1st round). It was a 0-0 draw in front of 15,000 and Hull won the replay 4-1. 11 January 1911: John Charles Peart signed as a professional. He played over 60 times before and after the war, and was also associated with Croydon Common and Margate. 11 January 1913: Croydon Common 0 Woolwich Arsenal 0 in the FA Cup. Arsenal won the replay against their south London rivals but were knocked out in the next round by Liverpool. 11 January 1915: The new Footballers’ Battalion (which was set up and funded by Henry Norris) marched through the streets to White City where it was barracked. as a prelude a couple of days later to a major recruiting event held at the Royal Albert Hall. 11 January 1926: After months of dithering the FA finally considered Jock Rutherford’s case having had a chance to look at the legal ruling. They concluded he had broken Rule 43 concerning being connected with betting although there was precious little evidence, and he had won his court case over the affair. Arthur Bourke in the Islington Gazette was outraged with the FA’s stance, but relieved that the FA now felt Rutherford had suffered enough and registered him again. 11 January 1930: Of course no one knew at the time, but the FA Cup third round game, Arsenal 2 Chelsea 0 was the start of the journey to the first major trophy. Appropriately for history, two of the club’s greatest players of the era – Lambert and Bastin – got the goals. 11 January 1936: Bristol Rovers 1 Arsenal 5 on the way to another cup triumph. Ten of the Arsenal team were full internationals – it was the first time this had happened in a senior match in England. 11 January 1951: Carlisle United 1 Arsenal 4. Arsenal had drawn 0-0 at Highbury in front of 57,932, but after this replay played Northampton in front of the biggest ever crowd at Highbury for a cup match. 11 January 1969: Arsenal 2 Sheffield W 0. It meant Arsenal had six consecutive wins; one goal conceded. It was the first “six in a row” in the league since March/April 1956. Gould and Radford got the goals. 11 January 1975: Arsenal 2 Carlisle United 1 in front of just of 21,538. Arsenal moved five points clear of the bottom three, as Radford’s first half goal came from what was just about Arsenal’s only good move, and Carlisle’s equaliser came because Arsenal’s defence acted as if they could not possibly believe that the visitors could even dream of mounting an attack, let alone scoring. 11 January 1979: Brian Talbot signed from Ipswich Town with whom he had won the FA Cup in 1978. He went on to play 327 games for Arsenal. 11 January 1997: Sunderland 1 Arsenal 0. Bergkamp was sent off; Arsenal’s fifth red in 10 games. Arsène Wenger noted three of the five red carded players were attackers saying, “When teams play Arsenal the games are physical and we have to defend ourselves”. 12 January 1907: Arsenal started the journey to the Cup semi-finals for the second successive season with a 1-1 draw against Grimsby, but as with the previous year the final was a step too far. 12 January, 1912 The press reported meetings of the English and Scottish League regarding claims of unpaid player transfer fees including James Maxwell who after two appearances for Arsenal mysteriously “went missing”. 12 January 1917: The Fulham Chronicle provided the latest in its series of shock-horror reports about the disintegration of English urban society with a story that a gang-culture had developed among the well-paid young men working munitions factories. An early sign of the middle classes being terrified of and demonising young men. 12 January 1918: Arsenal lost 1-4 “away” to Tottenham in the wartime league. Tottenham’s ground had been taken over by the military testing Enfield rifles, and so Tottenham were playing their “home” games at Highbury although a few like this one were played at Clapton Orient’s ground..
12 January 1922: All Irish prisoners taken during the War of Independence were released as the final arrangements ending the conflict were put into place. 12 January 1924: With Arsenal perilously close to relegation they increasingly depended on other clubs around them doing even worse than they were. On this day Middlesbrough lost to Watford of Div III (South) in the Cup, part of a run of 9 games with 8 defeats and 1 draw. It was a major factor in Arsenal’s survival. 12 January 1925: The FA Cup match away to West Ham was again called off because of fog, and again Arsenal manager Knighton claimed that he drugged the team before the match. Yet there was never any chance of the match being played as the whole of East London was fog bound and had been for three days. 12 January 1928: Andrew Kennedy sold to Everton. Kennedy played the first 13 games of 1925/6 before Bob John was moved into defence to replace him. He did however play in the last eight games of the 1926/7 season including the FA Cup Final. In all he played 129 times for Arsenal. 12 January 1935: Ehud (Tim) Rogers signed by Arsenal from Wrexham (of the 3rd Division North). One source quotes this date as 1934. He made 16 league appearances and scored 5 goals. 12 January 1993: Cup Match 7 in Arsenal’s Cup Double season. Arsenal 2 Nottingham F 0, in League Cup round 5. Ian Wright scored both goals. All in all Wright scored 10 in the FA Cup that season and five in the League Cup. No Arsenal player has ever scored more than these 15 Cup goals in one season. 12 January 1952: Norwich 0 Arsenal 5, FA Cup 3, on the way to another cup final. Lishman (2), Logie, Goring and Roper scored. 12 January 1974: Having beaten Norwich in the cup the week before Arsenal repeated the result winning 2-0. 22,084 attended and Brady made an early appearance while reports suggested Kennedy appeared to have no interest at all in what was happening. 12 January 2003: Birmingham 0 Arsenal 4. Two goals from Henry against Birmingham City took his Arsenal total to 100 goals in all competitions. 12 January 2008: Arsenal 1 Birmingham 1. Part of a 14 match run of 12 wins and 2 draws. Untold Arsenal’s first ever report focused on organised time wasting while the ball was out of play with the report headlined, “Arsenal witness the end of football”. 12 January 2011: John Jensen who was implicated in the downfall of George Graham signed a 6 month contract with Blackburn as assistant manager. 12 January 2011: Ipswich 1 Arsenal 0, Football League Cup semi-final. Having beaten Tottenham, Newcastle and Wigan thus far there still were hopes of making the final. 12 January 2012: Philippa Dawson, a direct descendant of Jack Humble (Woolwich Arsenal’s first chairman, and a director into the 1920s) addressed an AISA Arsenal History Society meeting in the House of Commons. She was the first member of the family to do so for four generations. The meeting was also addressed by Jeremy Corbyn, MP for Islington North, who in 2015 became the Leader of the Labour Party. 12 January 2017: Jon Toral loaned to Rangers. .13 January 1891: Fred Groves born in Shadwell and played for Barnet Albion (a club now seemingly lost to history) and Glossop North End, before signing as an amateur player in August 1912, turning pro 14 months later. He played for Arsenal in the relegation season and the first Highbury season and returned after the war. 13 January 1919: With the war over the Football League discussed re-starting the League programme, difficulties in getting players to away games, Players’ Union demands, and the amalgamation of the League and the Southern League. 13 January 1919: Athletic News published the first post-war article on matchfixing by Man U and Liverpool. The article proposed Chelsea should be reinstated to the first division. 13 January 1926: Final match for Harry Woods – the holder of the world record transfer fee for a short while. He finished as the club’s top goalscorer in 1923-24 with ten, and scored 12 in 1924/5 but was then replaced by Jimmy Brain as the key goal scorer. 13 January 1934: Joe Shaw’s first game as manager following the death of Herbert Chapman. Luton 0 Arsenal 1 (FA Cup 3). He went on to win the league for the club before returning to his duties as reserve team coach. Dunne scored the goal with 18,641 in the crowd. 13 January 1945: Peter Simpson born in Norfolk. He joined Arsenal’s groundstaff in 1960 – a common way of bringing in young players (clubs were not allowed to sign youngsters as players immediately after they left school at 15, although of course 15 year olds could work). He played 353 league games for Arsenal under Wright, Mee and Neill. 13 January 1960: Arsenal 1 Rotherham 1 (FA Cup 3rd round replay). After a 2-2 away draw this was expected to be easy at Highbury in front of 57,598 but it certainly wasn’t and Rotherham won the second replay. 13 January 1962: A home defeat to Bolton started a run of four consecutive losses and one win in seven, Arsenal scoring just five goals in those seven games. The run marked the effective end of Swindin’s career at Arsenal. 13 January 1975: Graham Rix signed as a professional for Arsenal but had to wait until April 1977 to make his first appearance. He went on to play 388 games for the club. 13 January 1979: Brian Talbot played his first game for Arsenal. He took over from Steve Gatting in midfield, and took over David Price’s shirt number. It made an immediate difference. Arsenal beat Nottingham Forest, the reigning European champions who had just knocked Liverpool out of the European Cup: Arsenal won 2-1 in front of 52,158. 13 January 1995: John Hartson signed from Luton Town just weeks before George Graham was sacked. He scored 14 goals in 54 games across three seasons before being moved on by Arsene Wenger. 13 January 1996: Arsenal got the last of four wins in 16 in Rioch’s nightmare run by beating Middlesbrough away 3-2. Merson, Platt and Helder scored. It was probably this run that started the board thinking that Rioch was not the man for the job. 13 January 2002: Arsenal 1 Liverpool 1. League match 21 of the third Double season. Ljungberg scored. Liverpool’s equaliser from a classic counter attack meant that Manchester United ended the day leaders of the Premiership on goal difference from Newcastle. 13 January 2006: Abou Diaby joined from Auxerre for £2m. Supremely talented he never recovered from one of the most notorious atrocious assaults in modern football executed by Dan Smith. After two years and 12 games in Scotland Smith moved into non-league football but was rarely able to get a game such was the paucity of his skills and his reputation for violence as his only footballing attribute. 13 January 2006: Emmanuel Adebayor joined from AS Monaco. The fee was reported at the time to be £3m although some reference works quote a fee as high as £17m. He played 104 times for Arsenal and scored 46 league goals. 13 January 2015: Yaya Sanogo loaned to Crystal Palace for the remainder of the season having scored only one goal for Arsenal, against Dortmund in the Champions League. He played 10 games but failed to score, as happened later with Ajax. 14 January 1899: Arsenal 6 Darwen 0 in division 2. Arsenal were later to face Darwen again, and this next time scored 11 . 14 January 1911: The FA Cup match against Clapton Orient was abandoned at 1-0 to Arsenal. Arsenal won the rearranged match 2-1. 14 January 1919: The FA met and agreed to allow the resumption of matches on days other than saturdays and public holidays and to permit clubs to start registering players from 1 May. In a separate meeting it was agreed to extend the next season into August and May. 14 January 1922: Arsenal beat Chelsea 1-0 in front of 40,000. The inside left, Reg Boreham scored his fourth goal in consecutive league games to give Arsenal a 1-0 victory. Strangely details of Reg Boreham’s life, and even the club he came from, are scarce in the extreme. 14 January 1925: The Arsenal West Ham match at the centre of the drugs “scandal” was finally played. The story only emerged 20 years later, in a sunday newspaper and then in Knighton’s autobiography and such evidence as we can find suggests the whole event was another Knighton fantasy. 14 January 1931: The replay of the Cup game with Aston Villa was held at Villa Park, with 73,668 in attendance (an amazing number for a mid-week afternoon game) and Arsenal won 3-1, with Brain joining the team to replace Jack Lambert, (David Jack moving to centre forward). 14 January 1933: The Walsall Experiment, in which Arsenal as last year’s cup finalists were knocked out in Chapman’s last ever FA Cup match. For subsequent impact see also here. Chapman rapidly transferred several players who were part of the game. Walsall won their next league game 8-1 against Mansfield. 14 January 1941: Goalkeeper Alex Wilson who had played his first Arsenal game in 1934 was transferred to St Mirren; one of the few war time transfers. He had played 37 games in the 1935/6 season when he was an FA Cup winner. 14 January 1961: Herd gained his second consecutive hattrick as Arsenal scored five for the second consecutive game – but only just got the win as it ended Arsenal 5 Man City 4. 14 January 1978: Arsenal 3 Wolverhampton Wanderers 1, continued Arsenal’s upturn. Brady took on the air of a man who was contemplating a variety of new approaches to playing football while reading a novel. Willie Young, whose form had so improved of late that he looked as if he could do everything right, then scored an own goal, just to prove he couldn’t. 14 January 1995: Hartson and Kiwomya made league debuts just weeks before George Graham was sacked. 14 January 1998: Port Vale 1 Arsenal 1 (FA Cup round three) in the second Double season. Arsenal went through on penalties 4-3. Having drawn at Highbury, there was no score in normal time, and Dixon missed Arsenal’s first penalty. The second double: part 1, part 2, part 3. 14 January 2006: Arsenal 7 Middlesbrough 0. Henry scored a hat-trick. This game equalled the highest Premier League win for the club. Senderos, Pires, Gilberto and Hleb got the others. 14 January 2008: The launch of the short lived Arsenal TV as part of Setanta Sports It was ultimately replaced with an online service after it closed on 7 August 2009 as Setanta was liquidated. It was replaced by BT Sport, but without Arsenal TV. 14 January 2008: After launching two days earlier Untold Arsenal published its first article: an attack on rotational fouling and rotational time-wasting. 14 January 2015: Benik Afobe sold to Wolverhampton Wanderers for £2m. He never played for Arsenal but had multiple loans including MK Dons where he scored 19 goals in 30 league and cup games. He scored 8 in his first 14 matches for Wolverhampton and in January 2016 moved to Bournemouth for £12m. 14 January 2016: Arsenal signed Mohamed Elneny from FC Basel. He played in Switzerland for 3 years making over 90 appearances and winning three consecutive Super League titles. He had also played for Egypt in the London Olympics in 2012. During the remainder of the season he twice won the fans’ award for player of the month. 15 January 1866: Possible birthdate of Joseph Cooper who played 24 games for Wolverhampton Wanderers before coming to Arsenal in 1893. 15 January 1887: Royal Arsenal continued their winning streak since their foundation just a few months earlier, with an 11-0 win over Alexandra United. 15 January 1891: The Derby Post made some seriously disparaging remarks about the journey to Plumstead ahead of Derby County’s away game against Royal Arsenal in the FA Cup. Although they related to just one day’s disruption on public transport they were re-used and oft quoted, suggesting that the tram and train system did not work. There is no supporting evidence beyond this one piece. 15 January 1899: Woolwich Arsenal’s half-yearly AGM reported the manager as W.R. Elcoat (ie William Elcoat) not George Elcoat as most Arsenal histories subsequently erroneously stated (until the Arsenal History Society set matters aright). 15 January 1910: FA Cup 1st round. Woolwich Arsenal 3 Watford 0. It was hoped a good cup run could alleviate the club’s financial worries. Sadly only 8668 turned up and Arsenal went out to Everton in the next round, although in front of 30,000. 15 January 1913: Woolwich Arsenal won their first home game of the season. It was a 2-1 Cup victory over Southern League local rivals Croydon Common. Relegation was already a near certainty, and the club only won three league games all season. 15 January 1918: Over 20mm of rain fell on one day as the snow melted and pitches became quagmires. On the same day 155 died in the Minnie Pit disaster in Staffordshire hit the news. Also the destroyers Narborough and Opan created a disaster of their own, as both ran aground and were wrecked off the coastline of Orkney in a severe storm. Only one man survived. 15 January 1921: Tottenham 2 Arsenal 1 – the first league derby following Arsenal’s move to north London (although there were previous friendlies). The crowd was 39,221, but the return match at Highbury a week later got a crowd of 60,600. 15 January 1927: The BBC undertook its first live sports broadcast, the rugby international between England and Wales. The first football commentary happened one week later. Arsenal meanwhile had an away game against Derby County. Buchan and Parker got the goals to give Arsenal a 2-0 victory. 15 January 1966: Death of Arthur Biggs. He signed for Arsenal on 27 October 1933 as an amateur player aged 18, having not been registered with any club before that point and became a professional on 14 December 1933, but only got two more games. 15 January 1969: John Radford’s England debut. He only played once more for his country. 15 January 1970 saw Arsenal defeated away to Blackpool of the second division in a replay in the 3rd round of the FA Cup 2-3. It was the last appearance as a player for Terry Neill (who of course later went on to be Arsenal manager), and for Jimmy Robertson – the first man to score for Tottenham against Arsenal and for Arsenal against Tottenham. 15 January 1972: Swindon 0 Arsenal 2, on the way to another cup final, but it was to be the start of the end of Mee’s run of success. In his remaining three seasons Mee’s Arsenal went out in the 3rd, 4th and 6th round. 15 January 1979: Arsenal 2 Sheffield W 2. FA Cup 2nd replay – the saga continued and Arsenal eventually played 11 games to win the FA Cup. Brady and Sunderland scored, in a game played at Leicester. 15 January 1999: Kanu signed for Arsenal from Inter for around £4m. He was reportedly the only Premier League player to have won the Champions League, Uefa Cup, Premier League, the FA Cup and an Olympic Gold! 15 January 2010: Samuel Galindo signed from Real America. Despite eight loan spells over the next five years, he never broke into the Arsenal first team for a league match and was reported not to have played a single game in his last four loan spells. 15 January 2010: Mark Randall loaned to MK Dons. He played in Bergkamp’s testimonial but never made the breakthrough and drifted into lower league Italian football before joining MK Dons in 2014. 15 January 2010: Kerrea Gilbert loaned to Peterborough. He got his chance in 2006 (the Year of the Seven Left Backs), and played in six league and cup games, but after his own injury never recovered. In 2014 he was reported to be playing for St Albans City. 21 January 1893: Sunderland 6 Royal Arsenal 0 (FA Cup). Arsenal had won through to the first round proper for the first time, but then saw the difference in quality between league and non-league teams. 21 January 1899: Adam Haywood scored the only goal of the match against Gainsborough to make it six goals in four consecutive games. Sadly only 2000 turned up to see the game. 21 January 1905: The last league game for Bill Linward. He came in and played two games in two days and made an immediate impact on the season. Overall for Woolwich Arsenal he played 50 times and scored ten goals. His prime season was the promotion season of 1903/4 when he played 27 times. 21 January 1924: The government of the UK lost a confidence motion and resigned paving the way for the country’s first Labour government on the 22nd. 21 January 1925: Alex Forbes born. He won three trophies with the Arsenal and stayed on as a coach, before moving to South Africa where he coached school children. 21 January 1933: In the aftermath of the death of Chapman Arsenal played Manchester City who were 18th and had a terrible away record of just two wins, no draws and ten defeats. It was a “must win” for Arsenal, before all their credibility was destroyed. Arsenal did win – 2-1 with Bastin getting both goals. It was the last match at Highbury until 11 February. 21 January 1936: There was outrage in the nation as The Prince Edward, Prince of Wales who was due to be King Edward VIII broke royal protocol by watching the proclamation of his own accession to the throne from a window of St. James’s Palace, in the company of a married woman, Wallis Simpson! 21 January 1939: Arsenal were Kings of the 1930s, but not of 1939, although on this day a 2-0 win over Charlton took them up to ninth in the league. Being already out of the FA Cup in the 3rd round, this was not going to be a typical 1930s year. 21 January 1956: Arsenal lost 2-5 to Portsmouth. Tapscott scored both our goals. It left Arsenal with just one win in the last six games. With the club taking two attempts to get past Bedford in the Cup it was a difficult time all round. 21 January 1987: Arsenal 2 Nottingham F 0 in the League Cup fifth round as Arsenal headed for their first trophy since since FA Cup win in 1979. Nicholas and Hayes got the goals. 21 January 1997: Andy Linighan sold to Crystal Palace for £500,000. He won the League, FA Cup, League Cup, and Cup Winners’ Cup with Arsenal. He went on to play 111 games for Palace before final short spells with QPR, Oxford Utd and St Albans. Also quoted in some reports as 27 January with a much lower fee. 21 January 2011: Aaron Ramsey loaned to Cardiff, the club from whence he came. He had already had an earlier loan spell with Cardiff, follfowed by one at Nottingham Forest. This time he played six games and scored one goal. 21 January 2006: Abou Diaby made his debut for Arsenal in a 1-0 defeat to Everton. A brilliant player whose career was wrecked by injury following a serious assault on him on the pitch. 21 January 2015: Arsenal announced the signing of 17 year old Polish teenager Krystian Bielik, from the Polish club Legia Warsaw, for a reported £2.4m. Having played just five games for Legia he was not sent on loan but trained up at the club. 22 January 1887: Royal Arsenal 1 Eastern Wanderers 0. The return game of Arsenal’s first match played on the Isle of Dogs – it was the newspaper report that this was the second meeting of the two teams that helped confirm that the first game (the Dial Square match) had actually taken place when reported. 22 January 1898: The first of three matches against local rivals Millwall in the space of four months. This was a 2-2 draw with 8000 in the crowd. 22 January 1910: The events began that led to Henry Norris taking over Arsenal. On this day Woolwich Arsenal held two vital meetings (one for shareholders, one for supporters) in which they confirmed the extent of their debts after playing their scheduled league game. 22 January 1910: Man U played their last home match before moving to Old Trafford – a successful move to a larger stadium that may well have been a model for Henry Norris with his move of Arsenal to Highbury three years later. 22 January 1914: George Drury born in Hucknel.. He played 40 times for Arsenal either side of the Second World War. He moved to Arsenal for £7,000 in March 1938 and won a championship winners’ medal and he also played in the notorious post-war match against Moscow Dynamo. 22 January 1916: The first London Combination wartime league ended with a 2-2 away draw with Brentford in front of only 2,500. The league had been set up to run only until January in the hope the war would be over by then. In fact a second league was organised to start the following week. 22 January 1918: It is clear from meetings he did not attend Lt Col Norris was again working full time for the War Office on the issue of conscription. It was also evidence that Arsenal was being left in the hands of others and that Sir Henry had no input into the club at this time. 22 January 1921: Arsenal played Tottenham for the second week running, winning 3-2 at Highbury – making this the first Highbury derby between the two teams. A crowd of 60,600 turned up – the highest thus far at Highbury. 22 January 1927: First live radio broadcast of a match: Arsenal v Sheffield U (1-1). The commentator was actually a rugby expert (Capt H B T Wakelam) who had the week previously commentated on a rugby match on the BBC. 22 January 1948: Peter Goring signed from Cheltenham. He went on to play over 200 games for the club in a 10 year period, won the league with Arsenal and appeared in the Cup Final. 22 January 1966: Blackburn 3 Arsenal 0 (FA Cup) followed three league defeats. In the four games Arsenal scored just one goal as Billy Wright’s tenure crumbled. It meant the club had not got past the 5th round since 1957. 22 January 1966: Last senior game for Joe Baker (FA Cup 0-3 to Blackburn). He had been Billy Wright’s first signing, and had a superb goals to game ratio scoring 93 in 144 league matches. He then played for Nottingham Forest, Sunderland, Hibs and Raith. 22 January 1972: Arsenal beat Huddersfield 1-0 with 36,670 at Highbury. Huddersfield were under no illusions as to the limitations of their play, and managed only two shots through the whole game, giving Wilson just one save to make. 22 January 1979. Arsenal 2 Sheffield W 0 in the fourth replay of the FA Cup 3rd round, as Arsenal progressed on towards the final. In all Arsenal played 11 FA Cup matches in the season. Gatting and Stapleton scored to see Arsenal through. 22 January 1985: Arsenal 7 Hereford 2 in 3rd round FA Cup replay. Marriner (2), Talbot (2), Nicholas, Anderson and Woodcock got the goals after a 1-1 away draw. 22 January 1989: Somerset Cricket Club 0 Arsenal 1, played in Bermuda as part of a two match mid-winter tour. Martin Hayes scored. The matches were arranged after Arsenal were knocked out of the FA cup in the third round and thus had a spare weekend. 22 January 1998: George Marks, the keeper in the “Arsenal Stadium Mystery” died. After leaving Arsenal he had coached with Reading, and then became a local government officer until his full retirement – which he lived out in Wiltshire until he passed on aged 82. 22 January 2003: Matthew Upson sold to Birmingham for £2.5m. He had played 35 league games for Arsenal, and went on to get 21 England caps and play over 250 Premier League games. 22 January 2008: Tottenham 5 Arsenal 1, League cup semi-final. Arsenal put out their usual reserve team, and thus suffered the first defeat to Tottenham since November 1999, as Tottenham responded with their first team. Arsenal however did beat Tottenham home and away in the league that season. 22 January 2012: Arsenal 1 Man U 2. Arsenal lost all three January league games and were said to have “no chance” of qualifying for Europe in 2012/13, being in a mix of three teams, each five and six points outside the top four. 22 January 2012 Park Chu Young made his first league appearance v Man U as a sub. His was one of the most curious transfers of all time and the reasons for it have never been fully resolved. 22 January 2018: Henrikh Mkhitaryan was signed from Manchester United with Alexis going the other way. 23 January 1915: Arsenal beat Stockport at Highbury 3-1 in front of just 6,000, showing just how far the war was disrupting the pleasure activity of the working men – even though there was still no conscription at this time. 23 January 1926: Arsenal were away to Liverpool who were 14th in the league before the game. Chapman played his standard team but Arsenal lost 3-0, showing that in this first Chapman season although the club was much improved, it could still have sudden defeats – as happened earlier at Newcastle. 23 January 1937: Arsenal made it nine without defeat. Although Arsenal only lost one of the next 12 there were too many draws in the season and Arsenal finished 3rd in the league as Man City came through to win the league for the first time. The following season Man City were relegated and Arsenal won the title for the 5th time in eight seasons. 23 January 1954: In a year of ups and downs Arsenal suffered 1-4 home defeat to Sunderland in front of 60,218. It was one of ten matches during the season in which Arsenal were seen by over 60,000 despite sitting in mid-table for most of the year. 23 January 1965: Arsenal 4 Leicester 3 made it three wins in three with Radford and Baker each scoring four during January. But Arsenal won only four more in the whole season, and ended up 13th. 23 January 2002: Leicester 1 Arsenal 3 – the match postponed from 1 January in League match 23 of the third Double season. Van Bronckhurst, Henry and Wiltord scored. 23 January 2005: Jermaine Pennant crashed his car and was charged with driving while banned, driving while drunk, driving uninsured, and giving a false name (“Ashley Cole”). He got a 90 days jail sentence, but was released after 30 days providing he wore an electronic tag – even on the pitch. 23 January 2005. Stuart Taylor ended his 3 month loan with Leicester. He had won a championship medal by playing as a sub in the final match of the season against Everton in 2002 with the title already won. Richard Wright started in goal, and Taylor came on, after 85 minutes. 23 January 2006: Matt Poom joined from Sunderland as short term cover. He made one appearance and later became Arsenal’s goalkeeper coach. 23 January 2007, Nic Anelka said that he would leave Bolton for Arsenal. But on 30 August 2011 he signed another contract with Bolton. 23 January 2013: Arsenal 5 West Ham United 1. Arsenal had 24 goal attempts. The match was due to be played on Boxing Day but postponed due to a tube strike. Podolski, Giroud (2) Cazorla and Walcott got the goals. 24 January 1891: Jimmy Boyle who played as centre half and in goal for Woolwich Arsenal, played his first Celtic match against Vale of Leven. ?24 January 1910: By deduction from other events this was the date on which Henry Norris called the press to discuss a rescue of Woolwich Arsenal – an event which led to the move to Highbury, and 15 years later, the appointment of Chapman as manager. 24 January 1914: Arsenal 1 Barnsley 0, with a goal from Rutherford in front of 19,000. Gaining three wins in a row Arsenal made it seven wins in eight games. 24 January 1920: Arsenal v Aston Villa attracted 55,000 to Highbury, the highest crowd thus far for a match at the stadium. Unfortunately Arsenal lost 0-1. 24 January 1931: Chelsea 2 Arsenal 1. Bastin scored in front of 62,945 and it meant that the FA Cup – Arsenal’s first major trophy – would not be retained. However the early exit undoubtedly helped Arsenal focus on their points record in the league. 24 January 1959: Colchester U 2 Arsenal 2 (FA Cup). Vic Groves got both goals. Having been knocked out by Northampton Town the year before there were clearly nerves, but Arsenal survived the replay. 24 January 1980: Some sources suggest that Terry Anderson’s tragic death by drowning was on this date rather than 5 January. 24 January 1987: Man U 2 Arsenal 0. Arsenal were beaten after an 18 match unbeaten run starting October 4 1986. Arsenal then went through a ten match run without winning a game including six consecutive games without scoring. 24 January 1988. Arsenal 1 Man U 2 – the eighth consecutive league match without a win. Quinn scored. But the next match started a run of seven league games without defeat. 24 January 1998: Ten years to the day after eight consecutive league games without a win, Middlesbrough 1 Arsenal 2, (FA Cup round 4) continued the march to the second Double. Overmars and Parlour scored. Overmars did not score another cup goal until the FA Cup Final.The second double: part 1, part 2, part 3. 24 January 1999: Wolverhampton 1 Arsenal 2. FA Cup 4th round en route for the final, Overmars and Bergkamp getting the goals. 24 January 2004: Arsenal had beaten Middlesbrough on 10 January 4-1 in the league, and on this day beat them at home in the FA Cup 4-1. 24 January 2006: Arsenal 2 Wigan 1 was not enough to get Arsenal through to the League Cup final. Having lost the first leg 1-0 Arsenal were set to win when Van Persie scored on 108 minutes before Roberts scored for Wigan in the final minute of extra time. 24 January 2014: Arsenal 4 Coventry 0. Arsenal fans showed complete support for Coventry’s plight under their hedge fund ownership by applauding their demonstration. Towards half time some of the floodlights failed but the teams agreed to play on. 24 January 2015: As FA Cup holders, Arsenal had had a long run of playing and winning all their games in London. However on this day they had to play outside the capital, but still won 2-3 at Brighton. Walcott, Ozil and Rosicky scored. 24 January 2017: Gedion Zelalem loaned to VVV Venlo. 24 January 2018: After a goalless first leg Arsenal beat Chelsea in the second league of the League Cup semi-final to go through to a final against Manchester City. 25 January 1890: Arsenal won 2-1 against Folkestone in the semi-final of the Kent Junior Cup, played in Chatham. Arsenal won the competition, this being their first trophy of significance. 25 January 1893: Royal Arsenal lost away to Oxford University as the club entered its last half year. While Arsenal were already professional and heading towards League status it shows that the gap between professional and university sides was not that great. 25 January 1896: Adam Haywood, one of our early stars, played his first game for Woolwich Arsenal, his first professional club. He retained his place and played nine consecutive games scoring and four and was part of the 7-0 thrashing of Crewe on March 21 1896. 25 January 1889: Sevenoaks 0 Royal Arsenal 7. Gradually it was becoming clear that the local rivals were not strong enough to stretch Arsenal. 25 January 1902: Despite challenging for promotion Woolwich Arsenal met their match in the fourth round of the cup losing to Newcastle 0-2 at home in front of 15,000, the season’s top crowd. 25 January 1908: George Morrell who had been reserve team coach at Rangers, and then manager of Morton joined Arsenal as manager. He stayed until 1915 when he left the club before the final game of the season. .
25 January 1913: Newcastle 3 Arsenal 1 made it 20 games without a win, including four straight defeats in January under manager Knighton. 25 January 1919: Arsenal beat West Ham away in the London Combination (wartime league) in front of 18,000 fans – not as many as had attended Highbury the week before, but still a huge increase on the figures for the previous year. 25 January 1930: Arsenal 2 Birmingham 2. The journey to the first trophy was not all plain sailing as this 4th round tie and the semi-final of the FA Cup both went to a replay. Jack and Bastin scored in front of 43,274. 25 January 1936: Arsenal played Liverpool in the FA Cup with the players wearing armbands and the singing of the national anthem and Abide With Me before kick off. 53,720 turned up and Arsenal won 2-0. 25 January 1940: Ted Platt’s debut, in a wartime league game v Tottenham. Although in peacetime he did notch up 53 league appearances between 1946 and 1953. 25 January 1960 Arsenal 4 Olympic XI 0. The first game for Terry Neill. He went on to play 240 league games before becoming player-manager of Hull City. He returned to manage Arsenal after Bertie Mee left. 25 January 1961: Arsenal 9 Oxford City 0, 4th round FA Youth Cup – one of our biggest ever wins. 25 January 1975: Coventry 1 Arsenal 1 in the FA Cup: the last game for Charlie George. He was always a favourite of the crowd, but had a very difficult relationship with disciplinarians like Bertie Mee. 25 January 1981: Francis Jeffers born. He scored 20 goals for Arsenal but never delivered to his potential and continued a nomadic existence seemingly ending of his career with Accrington Stanley in 2013 – although he was reported having a trial with Chester in 2014. 25 January 1993: Leeds United 2 Arsenal 2. FA Cup 4th round. This was cup match 8 in Arsenal’s Cup Double season. Parlour and Merson scored. 25 January 1996: Tim Rogers died aged 86. He had joined Arsenal in 1934 from the third division as a possible winger, but found the range of talent ahead of him too much to allow for a breakthrough. He moved on to Newcastle, and then again played in Wales. 25 January 2003: Farnborough Town 1 Arsenal 5, played at Highbury by arrangement. Arsenal donated all programme sales income into Farnborough; the Arsenal fans singing to the Farnborough supporters, “You’re supposed to be at home” as the teams came out. 25 January 2010: Vito Mannone signed new long term contract. However despite some fine performances (especially once at Fulham) he never became the first choice keeper. 25 January 2010: Philippe Senderos loaned to Everton. He made 84 league appearances for Arsenal, before moving on to Fulham and then Aston Villa where sadly he met Tim Sherwood who simply refused to list him in the 25 man squad. 25 January 2011: Arsenal beat Ipswich in the League cup semi final to make it to the the final. See also here Arsenal went through 3-1 on aggregate with goals by Koscielny, Bendtner and Fabregas. 25 January 2013: Frimpong joined Fulham on loan. He showed promise but somehow could not hold his temper in check and by 2016 was reported to be playing in Russia but suspended after reacting to racist abuse. 25 January 2015: Brighton 2 Arsenal 3. In the 4th round of the FA Cup. With the media anticipating an upset, goals from Ozil and Walcott in the first 25 minutes and a third from Rosicky meant the victory was never in doubt. 25 January 2015: It was confirmed that Joel Campbell would join Villarreal on loan until the end of the season and there were thoughts that he might never play for Arsenal, but he returned for 2015/16 and took advantage of injuries to others to claim his place in the team. 26 January 1889: St Luke’s 5 Arsenal 0 – a reminder that Royal Arsenal were strong but certainly not invincible in the early days. 26 January 1891: Royal Arsenal 0 Everton 5. After three games in which Arsenal scored a total of 16 goals the club (which was playing its final season as amateurs) was brought down to earth by first division Everton. 26 January 1895: Crowd incidents in the Woolwich Arsenal v Burton game led to the ground being closed by the FA for two games. The original sentence proposed was that the ground would be closed for the rest of the 1894/95 season. However, on appeal a “compromise” of 6 weeks suspension was agreed upon by the FA. See also here. 26 January 1918: Tottenham 0 Fulham 1 at Highbury (as Tottenham’s ground was closed for the duration). Sir Henry Norris attended with his daughter who took her dog into the directors’ box. The dog then escaped and then ran on the pitch and play was stopped while it was rounded up. However this story also turns up in another match so may not be true. 26 January 1925: WHU 1 Arsenal 0 (at Stamford Bridge). The second replay of the FA Cup match that was the scene of the Arsenal drugs scandal. Curiously the only source for the story is the man who dished out the drugs to the team: the Arsenal manager who claimed he didn’t know the man who offered him the pills! 26 January 1926: John Logie Baird demonstrated a mechanical television system in London – the first faltering steps towards TV. 26 January 1957: Ex player Freddie Cox DFC started his most famous FA Cup run as a manager of Bournemouth, beating Wolverhampton Wanderers and Tottenham Hotspur before narrowly losing to Man U. 26 January 1969: James Ramsey died. He went to Arsenal from Kilmarnock in 1924, and returned there in 1926, leaving Arsenal after 75 games. 26 January 1971: The journey to the Double was held up by a waterlogged pitch for the 4th round cup replay at Portsmouth. 26 January 1980: Arsenal beat Brighton And Hove Albion 2-0 in the cup with 43,202 in attendance. After some poor performances Brady and Rix were back to their best and Arsenal could have reached double figures, except the Brighton keeper had the game of his life. 26 January 2005: Jackie Henderson died in Poole, Dorset. He played for Scotland and was a great favourite at Portsmouth, but couldn’t pull Arsenal through on his own. 27 January 1894: Woolwich Arsenal suffered their first cup defeat: 1-2 at home to Sheffield Wednesday. 27 January 1916 conscription was finally introduced through the passing of the Military Service Act. Unmarried men aged 18–41 were conscripted from 2 March with married men added to the list the following month. All players were thus called up either to fight or work in wartime industries. Henry Norris’ moved to work in the regional organisation of conscription for the War Office. 27 January 1948: On this day Don Roper was injured.against Aston Villa and although the team initially did well without him (winning the next three games) a run of seven games without a win took its toll, as Arsenal ended up 5th. 27 January 1951: Arsenal 3 Northampton Town 2 (FA Cup) in front of 72,408 – the all time FA Cup record at Highbury. (Lewis 2, and Roper got the goals). See also here. 27 January 1989: Bermuda 2 Arsenal 4 (friendly). 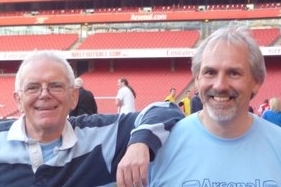 (Richardson 2, Smith, Winterburn), during a two game winter break, arranged quickly after Arsenal were knocked out of the FA Cup in the third round. 27 January 1997: Andy Linighan sold to Crystal Palace. Two versions of this transfer are told, one citing 21 Jan for £500,000 and one citing 27 January with a much lower fee. 27 January 2001. QPR 0 Arsenal 6 (FA Cup round 4). Wiltord scored two goals, and there were two own goals. Pires and Bergkamp got one each en route to the final. 27 January 2002: Arsenal 1 Liverpool 0 (FA Cup 4) en route to the 3rd Double. Having beaten Watford in the third round Arsenal saw off Liverpool in the fourth with a goal from Bergkamp in 27 minutes. 27 January 2015: Joel Campbell loaned to Villareal for the remainder of the season. He had made his debut for Arsenal in the Community Shield game, and that and his world cup exploits in 2014 had suggested he might now play regularly for the first team but it was not to be until the following season. 28 January 1888: Royal Arsenal 6 Champion Hill 0. There’s no record of Champion Hill FC, although Dulwich Hamlet moved to the Champion Hill ground in Southwark in 1912. Dulwich Hamlet was formed in 1893, and it is possible that this match was between Arsenal and the club that preceded Dulwich Hamlet. 28 January 1899: Arsenal 0 Derby 6, FA Cup. A reminder that Arsenal were a long way short of the standard in the first division (despite scoring six themselves on three separate occasions in the League)..
28 January 1918: It is often forgotten that in the first world war there was considerable bombing of London by enemy aircraft, and on this day London experienced its heaviest bombing of the war. Highbury escaped undamaged. 28 January 1931: Arsenal’s biggest win at Highbury. Arsenal 9 Grimsby 1. Four from David Jack and three from Jack Lambert. The crowd was 15,751, the lowest home crowd of the season. 28 January 1950: Arsenal 2 Swansea 1, FA Cup 4th round, en route to Wembley. Goals from Logie and Barnes (a penalty) saw Arsenal through. This was the first season Arsenal played all their FA Cup games in London. 28 January 1978: Four days after reaching the semi-finals of the League Cup Arsenal beat Wolverhampton Wanderers 2-1, with 49,373 in attendance to reach the 5th round of the league cup. Sunderland and Macdonald scored. 28 January 1998: Arsenal 2 Chelsea 1 (Coca Cola cup semi, first leg). Overmars and Hughes got the goals. 28 January 2004: Jose Antonio Reyes transferred from Sevilla for £10.5m. The home supporters didn’t want him to leave, and much was expected of him, but he didn’t always show the talent he undoubtedly had, either at Arsenal or later. 28 January 2011: Carlos Vela loaned to WBA. He had shown moments of brilliance, but never quite made it at Arsenal. 28 January 2017: Just two months after Southampton had knocked Arsenal out of the League Cup, Arsenal beat Southampton 0-5 away in the 4th round of the FA Cup on their way to their third FA Cup triumph in four years. It was one of two FA Cup matches this season in which Arsenal scored five goals. 30 January 2008: The Court of Arbitration in Sport laid down the Webster ruling that stated that all players can leave their club after three years, irrespective of what the contract says. Although rarely understood in the media, it became a major part of negotiations between clubs and players in the third year of a contract. The Anniversary files now have over 7000 entries, and are now divided into monthly sections. I would particularly like to mention Richard Lerman and David Brown, and their wonderful (but now tragically out of print) volume “The Gunners: Day to Day Life at Highbury”, which is a mine of information. Also to “Arsenal On This Day” by Paul Donnelley (Pitch Publishing). Also where would any of us be without “Arsenal a complete record” by Fred Ollier (Breedon Books), now replaced by “Arsenal the complete record” by James, Andrews and Kelly. Plus “Arsenal the football facts” by Dean Hayes (John Blake). If I have missed another sourcebook, please do let me know and I will correct this at once.